Another book recommendation by a TY pupil on reading for the Extended Essays, which are now being handed in. "I enjoyed this book a lot, and would recommend it for a variety of reasons. 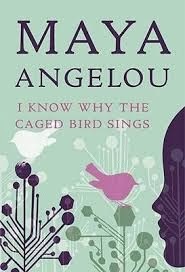 The book is set between Stamps, a small village in the Southern part of the States and St Louis, and gives us the autobiographical point of view of Maya, originally Marguerite, a black girl who was shipped off to her grandma's to be brought up. It's the travelling between these two destinations and the contrast between them that really makes this book. Also, the book is beautifully written, taking us through the author's childhood is a way that emphasises the small details you wouldn't normally notice, giving them a new level of importance that really makes it seem as if it was the seven or eight year-old Maya writing. It is a very emotional book in that it takes us through many hardships that she has to endure, but she manages to write about them in a way that is almost elegant. All in all I rate this book 4.5 out of 5, 0.5 deducted for the ending which I thought was a bit abrupt - for me it just needed more of a elaboration after the climax."